These processes are used to lock-in any contaminants within a material. 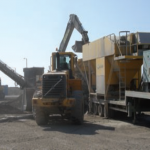 Typically such a material (sometimes identified as a “hot-spot” on a brownfield site for example) is dug out (after suitable lab assessment) and then passed through mechanical sorting (screening) before being processed through the continuous mixer. Emulsions (encapsulation) or cement/bentonite (solidification/stabilisation) agents are added in controlled doses to the host material. Lab trials determine the mix design criteria, to ensure that the contaminants are suitably remediated. OCL Regeneration Ltd then mix the host material to the agreed spec using any two powder or liquid agents, depending on the design. As the process is cold it is approved for the remediation of aromatics (e.g. Coal Tar contaminated materials). 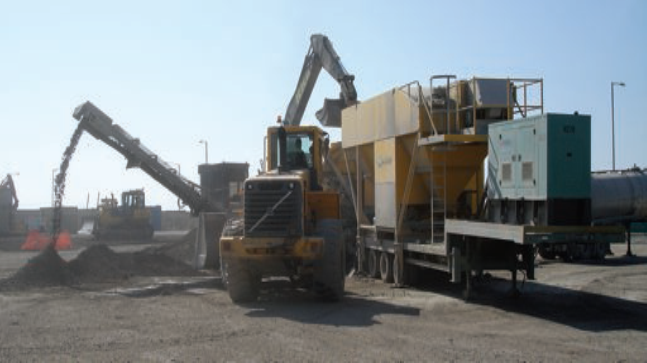 This means that rather than being removed from site and disposed of at an approved landfill (often a long way away and very expensive) the material is remediated on site, with the resultant product often having improved engineering qualities and being used as a high quality material in the ongoing scheme of construction or restoration.